This is about what judgments really are. They are a tool for understanding reality. This relates to the Dualistic Conceptual Framework, which is an explanation on how to use judgments. Some people think judging is wrong, even though to judge that themselves, they are judging, which makes their conception, conclusions, and judgment a double-think delusion itself. Some people think all judging comes from the negative-ego of selfish personal attempts to make oneself look better than others. This is not true judging. Those who think all judgments come from this domain of attempted superiority are fooling themselves because they do not accurately understand the tool at their availability and are in a place of ignorance to understand it’s value and continuous use in life. Judging comes from looking at things, analyzing, criticizing, differentiating, distinguishing, relating, corresponding, comparing, and using your intellect, intuition and conscience to discern, consider, weigh, distinguish, evaluate, asses, diagnose, associate, identify and draw sound conclusions from critical thinking and good sense, to determine what is right, good and true, compared to what is wrong, bad and false. It is basically common sense if you listen to and have a developed and awakened conscience and heart, and have a mind with developed tools to prevent you from being fooled, conned, tricked, duped, deceived, mind controlled, etc. If you don’t do your thinking for yourself then you are running someone else’s program and will not be able to judge reality accurately given this programs influence on what you accept as “true” and therefore affect the expressions of consciousness and way you live your life. There are many mind-virus programs that inhibit accurate observation and assessment of reality, what ‘is’, Truth, and the more conditioning and deceptions you have bought into, the more your path will be directed for you towards an end that is in line with their goals. Judging is part of the solution to this problem. If you do not understand yet, you will, that is, if you are being honest with yourself. The etymology for the word judgment has court based definitions of “trials”, “legal”, “court” but also more accurate, non-establishment, non-authoritarian based definitions. Please forget about the state control authority to sentence people, and think of it in the way I am talking about in a general sense. The root of judgment, the word judge, also means “to regard, consider.” It is about looking at things, observation, in honesty to see them as they really are. Judge is a compound of ius “right, law” (just ) + dicere “to say” (diction). It is to speak the Law, Natural Law, Universal Cosmic Natural Moral Law. That is the Law that one uses to make accurate, correct, optimal, valid, moral, right, good, true judgments in life about our choices, decisions, actions and behaviors, and those of others we can observe. Not many people truly understand Natural Law, and as a result not many people are able to make valid, accurate, optimal judgments in alignment with Natural Law principles of Truth. There are black-robed Saturnian judges who violate Natural Law and uphold delusional man’s law. from PIE root *deik- “to point out” (cf. Sanskrit dic- “point out, show,” Greek deiknynai “to prove,” Latin digitus “finger,” Old High German zeigon, German zeigen “to show,” Old English teon “to accuse,” tæcan “to teach“). Ment, from the end of judgment, is not really needed, since the sufix –ment is to indicate the something done by the verb/action. But if we consider green language, then ment is from the ablative singular of Latin mens, meaning mind, to think. Together just and diction makes: to teach, show, prove, or point out what is just, right, equitable, upright, Law. A finger points things out, and to judge is to point out the Law, Natural Law, what is right, good and true. We can observe and point things out that are in harmony with Natural Law or in violation of Natural Law. With green language, Just-Diction-Mind, is to use the mind to point out the what is right from wrong, and rectify and make upright that which is not. From etymology, we can see that judgment is about showing, pointing out, what is wrong from right, and then rectifying those wrongs and making things right again. It is the same with the alchemical vitriol. Dissolve and wear down the lies, deceptions, illusions, wrongdoings, make them known, show them to be something not to be respected. It’s all about morality, right from wrong, Natural Law, truth, Love, Good, etc. Judgment can be properly understood for the tool it is meant to be. If we fail to observe and discern correctly it is only ourselves to blame for being incorrect in misjudgment and ignorant of an aspect we failed to perceive, and perhaps we appear inane or stupid as a result of acting on these flawed judgments. We can develop our observation skills, increase our conscious awareness, and judge things for what they are and raise our level of consciousness through attainment of more Truth, reality, what ‘is’. When people call out “judgmental!” as if it’s some valid logical response to invalidate or dismiss a statement, it isn’t. Being judgmental is making judgments. What are valid judgments to make? Judgments are about what is right and what is wrong. Judgments are about morality. Hence, judgmental is making moral judgments. In our current degenerate society of mind control conditioning to engage in wrongdoings while attempting to fabricate them into “rights,” we can see how people like to shout “judgmental” whenever they can. They use this word to attempt to invalidate right from wrong because they are not living in alignment with right, good, truth, love, morality, etc.. People do not like to hear about the wrongs being done in the world, and certainly not about the wrongs they are a part of. So remember, whenever someone calls you “judgmental” because you are pointing out right from wrong, they are just trying to shut you up because they don’t want to face the Truth. It is that simple. Anyone, who tries to invalidate or dismiss something you say by labeling it “judgment” or “judgmental”, when you are speaking Truth, or about right and wrong, is trying to manipulate you. They have no valid response. It’s an attempt to disqualify the validity of what you say through emotional mind control of a word, “judgment”, by representing it as a negative and therefore invalidate the argument. The only valid criticism on judgments is when they are 1) incorrect, inaccurate, or 2) based on appearances of other superficial aspects that have nothing to do with right or wrong. We can make fairly valid judgments of what is around and within us as long as our information comes from relevant and accurate perceptions of reality, what ‘is’, the truth. The irrelevant perceptions and appearances of fashion, clothes, cars, home, club membership, career status, or anything superficial that some people use to determine if someone is better than another, are false judgments because they do not deal with right or wrong. This is why we should not judge on external appearances of these superficial things, but on the external expressions of consciousness that actually do matter. These are the actions and behaviors we engage in that either produce harm or don’t, are wrong or are not wrong, immoral or moral. One may still gain insights about another’s current psychological state through their attachment to these superficial illusions, but a person is most accurately represented by their current thoughts, words, speech, writing, behaviors and actions. The expression of consciousness of emotion is felt within, but the feelings do not necessarily express themselves physiologically on the exterior. Emotions remain mostly exclusively within an individual unless externally expressed or manifest in a physiologically observable way. If someone does something wrong, and we point out what it is, then we are not doing anything wrong by using the power of observation, analysis and critical thinking to draw a sound conclusion that makes sense. We recognize what someone does is wrong because we know what wrongs are. It’s simple. The ego-personality-identity attachment to what a person does as actions and behaviors doesn’t like being shown its own error and manifests defensive reactions to indicate this. Emotions are our moral guidance system when used properly, our internal compass for heading in the right direction and doing what is right. Attuning ourselves to our moral compass is made possible when our left and right brains are operating in conjunction, in harmony, within the Neo cortex. 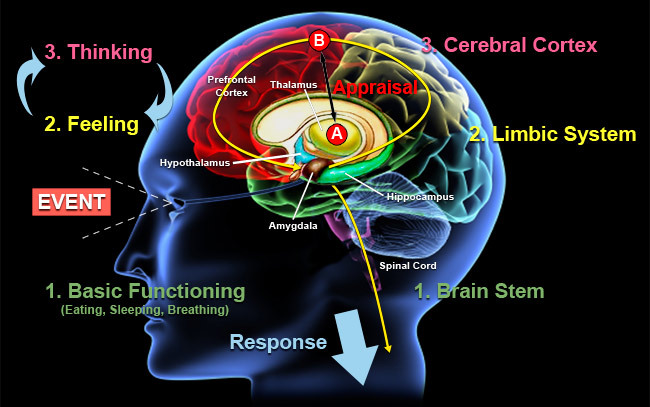 Harmony of the two hemispheres allows us to engage the midbrain in its proper role as a guidance system for emotions. The limbic brain sends feedback to the cerebral cortex, the part of the brain that we make judgments with, for decision-making, for discernment. Choosing one thing among many, i.e. making a decision. Since accurately judging through observation to discern one thing from another thing and accurately describing anything is perfectly fine, and we do it countless times in a day. The reaction from someone who will immediately respond with the word judgment, judgmental, etc. (as if it’s “wrong” to evaluate and point out what is actually wrong, immoral, bad, harmful, etc. ), or who will react in a defensive way to dismiss, avoid, ignore, deny or reject the Truth, will indicate that there is an ego-personality-identity attachment made to what is being examined. Instead of recognizing it as the Truth, they label it as a “judgment” in a pejorative sense or use some other dismissive tactic. Some people have been conditioned to think that we can only judge something that has nothing to do with anyone else. That is to say, that as long as we are observing, discerning, analyzing, critically thinking and talking or writing about something that someone else isn’t falsely attached to through their misconception of their own identity, then we are okay to go, our judgments will likely be accepted. It comes down to believing we can’t talk about other people and tell them the truth because that would be “judging” them. They consider that as long as you aren’t judging someone, what they do, what they think, etc., then you can judge. The truth is people judge themselves. All we need to do is see. If you are familiar with the Truth is Love or Higher Self articles, you can understand this as the common force of Truth, Love, Good, Right, Moral, Natural Law, Higher Self, Higher Will, Spirit, God, etc. Natural Law is cause and effect, and there are consequences to our negative behavioral manifestations of consciousness. Action and reaction. The judgment of our actions is beholden in the effects manifested that we can see. Each Man is a reference to Man as a being in that book, since human comes from humus, the soil, and isn’t as dignified. Each human judges themselves by their own actions and the consequences of the effects they manifest as a result. Natural Law, cause and effect, etc., will be a reciprocation of what we put out, what we sow we shall reap at some point in some form. Natural Law judgment is our own judgment we create when we choose to behave and act in certain ways that are contrary, oppositional, conflicting, unaligned and nonintegrated with Truth, Love, Good, Right, Morality, Natural Law, Higher Self, Higher Will, Spirit, God, etc. Learning what is true is better for you. The more you say, the more you do, the more I see of you. Observation reveals what people do themselves, by their own actions and behaviors. The truth is revealed to those who have the eyes to see and the ears to hear. We can speak the truth we recognize and understand, although others often do not want to hear it due to their attachment to falsity, lies, deceptions and illusions. Truth can help us recognize the wrong we are a part of and choose to no longer participate in it. That is what making accurate diagnoses, judgments, assessment, evaluations, etc. is about. We have to learn to let go of our attachment to illusions upon which we base aspects of our ego-personality-identity construct. Since we can judge, and if the judgment is accurate, then it indicates that the person who does not want to accept a certain conclusion may be lacking information, preferring to call it “judgment” or use another dismissive tactic. By basing our decisions, judgments and choices on a lack of information, with attachment to falsity we have accepted and identified with, we will be more inclined to reject the information that upsets our self-conceptualization, the self-image we have constructed about ourselves which is part of the ego-personality-identity construct. If we can dissociate our identity from the illusory constructs of belief we are attached to then we may be more willing to honestly look at information, gain knowledge and develop an understanding, thereby increasing our conscious awareness and evolving consciousness towards greater attainment and embodiment of Truth, Love, Good, etc. We are all ignorant to some degree, some know more than others in some subjects and the reverse is true. We approximate degrees of probable certainty of specific perspectives and perceptions of Truth by removing contradictory information from the overall big-picture holistic understanding of how things interrelate, interconnect and correspond in the Great Pattern. We have to be willing to doubt. If this makes you feel insecure, that is perfectly good because it means you doubt what you believed and accepted previously. We cannot progress if we continue to accept what we were told or what we have become attached to as the real truth. When someone presents something that has validity, I check into it, because I use doubt in a useful way through apophatic learning. I end up learning more about what something is not in the end, and confirm with greater certainty the conclusion I had drawn from the already existing connections in the pattern recognition of how things correspond. One more piece is added. Another connection is added to the web to make is stronger. For some things that I cannot verify through my own experience, I can be wrong about, and doubt can help me recognize it and align my perceptions with what ‘is’, reality, Truth. The truth hurts when you are not ready for it. That is why the ego reacts in these ways when it feels under attack from the truth, because that would shatter the illusions it is attached to and a piece of false identity would possibly be washed away, and that means diminishment of the ego-personality-identity construct many of us are so attached to. The denial of Truth in others may seem like they want you to feel bad about your attempt to shed light on the darkness, to speak truth against the deceptions, for being correct, for being right. There are many tactics to avoid facing one’s own shadows, darkness, demons and negative manifestations of being and living that cause harm to innocent sentient animate beings. I understood why New Agers are really into the “no judgment” thing due to Gregg Braden’s Divine Matrix videos. They actually Fear judgments. Judgments will create negative feelings inside of you, and these negative feelings create dis-ease and diseases. Hence, do not judge things, just be positive, and don’t let that negative in, or else you will be in ill health. Do not face reality, do not feel the truth about the wrongdoings occurring in the world that you may be partly responsible for, do not use your emotional compass to face yourself. It’s all about a remaining in a “feel-good” sense, afraid of becoming ill with manifestations of consciousness that represent your internal compass telling you when something is good or bad, right or wrong. When you deaden your ability to feel the negative polarity of emotions that are produced from facing reality in its negative, horror and darkness, you limit your development in consciousness, as well as limiting your ability to feel what is right from wrong. The continued negation of facing reality as it ‘is’, or the continued negation of feeling reactions to reality’s negative manifestations, will result in a more dormant ability to detect wrongdoings with the emotional compass and neocortex feedback. You will have trained and conditioned yourself to not feel the negative representations of external stimulus. You will have trained yourself to not be a full human being, denying a part of what helps us navigate reality. You need judgment, discernment, differentiation, distinction, critical thinking and the ability to draw conclusions from existing differences and similarities. You need to be able to look at new information honestly even if it is contrary to what you currently have judged to be the way something is. You can be wrong. Do not let your incorrect judgments hold you back from discovering new more accurate perceptions and perspectives of reality. Building up from solid core principle foundations of Truth is the way we can verify if our judgments, assessments, diagnoses, discernments, analyses and conclusions contain any contradictions at the core level. Many taking the spiritual path are often fooled into thinking they have transcended or conquered the ego. They accept fanciful pseudo New Age thinking such as judgments are wrong and they just want to have this “feel-good” comfort by ignoring things. This is just the ego shifting into a new desire you have and further taking you off a true spiritual path by having a focus on selfish well-being comfort feelings at the cost of ignoring truth. This is complete folly and misunderstanding of the spiritual journey and path towards Truth. You need to be aware of things and you need to see them as they are and accept that as a reality. You use judgment to discern from your observations of what actually is and what is not. Some people think that by eliminating judgments that they will then no longer have to feel negative about things but this is just ignoring what ‘is’ and refusing to accept the current state of something. You can also see things as they are, judge them accurately, and not be fully absorbed in the negative emotional expression, but you recognize it is there and know that it represents a negative recognition of something. You are the one creating the feeling through recognition of something. Do not simply ignore reality that is hard to face because it makes you uncomfortable, because it removes the feel-goodness. Face it, and choose to apply the Law of Neutralization to elevate yourself above the plane of effects and not have to be wrapped up in the rhythm of the pendulum of emotions. Do not let the emotions control you. Recognize it is there, and what it is telling you about something. Feel the spectrum the emotional compass provides us with. The negative is a teacher. Not facing it will allow it to persist. The reason that people espouse a teaching of “do not judge” is because of what that judgment does to you internally, the feeling it creates inside of you. Whatever you are afraid of lowers your consciousness (Fear), and the reason you are afraid of it and do not look into it, is because of the negative judgments you have preconceived of it, in your refusal to accept the truth of what is currently our reality. The negative is there, judge it accurately, your feelings of it are yours to control. Stop hiding from what ‘is’ just to remain in comfort and “feel-good” about your perception of reality, yourself or your behaviors and actions that create harm against other sentient animate beings. People incorrectly, erroneously and falsely judge from the perspective, worldview and mindset of the status quo, the condition of the way things currently are, of the way they currently believe things have to be. It is acceptance and perpetuation of the conformed to, group-think, hive-mind propagated mind virus. When you’re working under manipulations, lies, deception and illusions, then your judgments will most likely be incorrect and inaccurate and this is when it is incorrect to judge because you’re judging from falsehood and not looking at reality as it ‘is’ and not accepting the truth. You can judge, but your judgment will not be valid. When you have truth then you can accurately make judgments because you then see reality as it ‘is’, the negative and positive, the good and the bad, the beauty and horror, and you accept that this is currently how it is, and you do not lie to yourself to pretend that things are not this way. The conscious mind doesn’t want to deal with it. It doesn’t want to deal with conflicting information. It doesn’t want to deal with the trauma of facing the evil and wrong you are a part of, it is easier to ignore it. Any horrific event triggers trauma. The enslavement, exploitation, harm, suffering, violence or murder of innocent sentient animate beings you participate in is horrific and traumatizing. It is easier to have an emotional reaction so that you don’t have to deal with it in the conscious mind, just react emotionally and avoid dealing with the trauma consciously. Fear of Truth causes this because we are in rejection and denial of Truth, the Fear, rejection and denial of what we are doing. The rejection of alignment with what is Truth, Love, Good, Right, Moral, Natural Law, etc. It doesn’t make sense to you that you are participating in evil. You can’t accept that you are a part of this, therefore it must not be this way. The trauma of what you do through your actions and behaviors is submerged into the subconscious and not dealt with. Whenever someone brings up your participation in it, you may react negatively because you don’t want to deal with the truth, or you “act” calm because you are quite content with believing whatever you want about yourself, living in a delusional fantasy reality to remain comfortable and “feel-good” about yourself and the self-image you have created. “I don’t want to deal with what I am doing and what I am responsible for, I would rather ignore it, avoid it, or outright deny and reject that I am a part of evil and wrong in the world.” It is trauma. You are participating in enslavement, exploitation, harm, suffering, violence or murder of innocent sentient animate beings that did you no harm. It is traumatic to face the reality of that fact. When you don’t deal with the truth, when you avoid consciously processing it, and the trauma of that Truth is pushed into the subconscious mind to avoid dealing with the discomfort. It allows us to continue to go on with our lives and not deal with reality. It is a protective mechanism to sustain the current structure of the ego-personality-identity construct. This can manifest as cognitive dissonance where we deflect by bringing in non sequiturs, change the topic, or try to excuse or justify our wrong doings in irrational ways. Conflicting information about you is presented and cannot be accepted for the truth of what it ‘is’, so we need to invent and fabricate wrongs into delusional “rights”. The idea of “not judging” is to not make yourself feel negative, and not create “dis-ease”. It is people’s own insecurities that prevent them from accepting the truth, from facing reality and accepting the current condition. If someone makes a statement or judgment that is right and correct, and you get offended, that is still your issue. You are offended by the truth because you do not want to face something within you that you fear to admit. Your ego does not like being wrong. It wants to be the boss that is always right. The ego tries to prevent you from evolving, from changing, from bettering yourself by getting you emotionally involved, under emotional mind control, ignoring the actual truth delivered and focusing only on your own reaction to that information. It keeps you from seeing and hearing accurately. You don’t listen to the information, you only react because of the effect it has on the ego-personality-identity attachment. Saying something is “judgmental”, “taking-sides”, “comparing”, “choosing”, and other dismissive tactics is trying to diminish the validity of Truth by attempting to distract and deflect from the issue through a negative characterization of what is being presented. We should learn how to judge correctly, not fear judging. It is part of life in this ego-personality-identity construct. By no means am I saying to tell people they are worthless or whatnot because of their current limitations in accepting truth and reality for what it currently is, but people have to understand the need to look at their darkness and shadow, sublimate and transmute it, and bring in more light, truth, goodness, rightness, love, morality, etc. You are not worthless, you have great power and value, but you have to accept Truth and align with it to empower yourself. When someone says “that’s a judgment,” well yes it is, but so what? It like saying “that’s an apple, that’s an orange, etc.” You are pointing out what something is, OK, what is the relevance? You judge to point out that someone is judging, shall I say you are judging, and then you say I’m judging again, then that goes on forever into infinity? Pointing out judgment is like saying “that is a cup.” Yup, that’s a cup. That’s a judgment. Yup, it’s a judgment, and? What is your point? I made my point with my judgment, what is the point of you identifying and judging it as a judgment, apart from trying to negate or invalidate what I said? It’s ridiculous. Everyone judges, get real and deal with it. Judging is discerning, a part of the intellect, which everyone has and uses every day (some more accurately, and some less accurately). It is part of our existence. To worry about judging is to judge yourself for having judgments and that will put you down a negative path obsessing over nothing. Everyone judges every day. Reading this is a judgment process. Stop lying to yourself, you do judge. Get over it! This is phenomenal work! Thanks Kris I learned a great deal from this.